Over the years I’ve sometimes been a vocal critic of the AAR, our field’s largest (and by implication, therefore the main but hardly the only) professional association. But today I received an email thanking me for twenty five years of loyal membership. While I’m not sure what others will make of that streak of renewals, it strikes me as indicating that a fair bit of my funds have supported the organization over that quarter century. 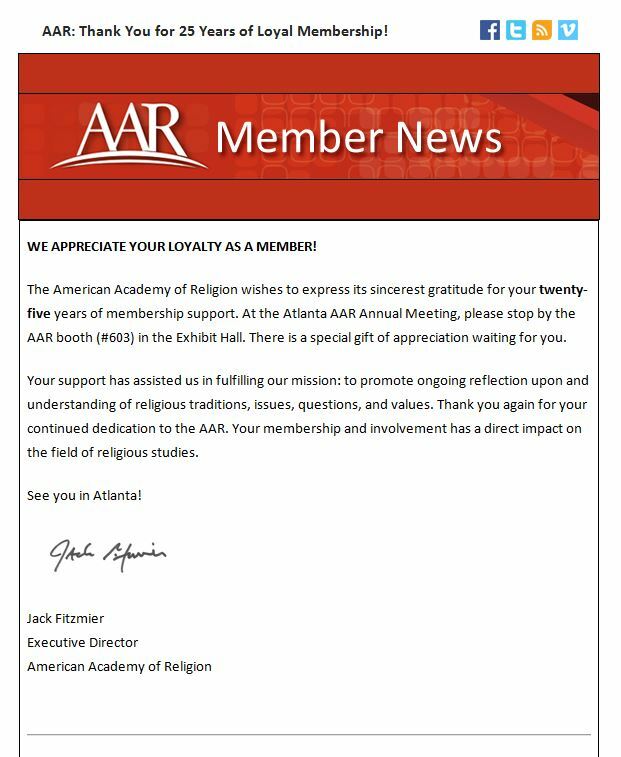 And so while those annual membership dues bought for me things like the journal and contributed my fair share to running and staffing the main office, I’d like to think that it also purchased for me the opportunity to suggest ways in which an organization to which I belong could be stronger and also better represent scholars of religion like myself. So consider me a member of the loyal opposition — coz, like the ruling party, they’re no less a part of the Parliament. This entry was posted in Faculty Blog, Religion in Culture and tagged American Academy of Religion, Loyal Opposition by Russell McCutcheon. Bookmark the permalink.